Rep. Mat Erpelding’s bill to provide workers’ compensation coverage for post-traumatic stress (SB1028) passed the Senate 31-4 and is on its way to the House for a hearing tomorrow. I’m a co-sponsor, and am greatly hoping we can provide this critical support to our first responders. HJR2, the bill that would have created a partisan redistricting process in Idaho in lieu of our current bipartisan system, was sent back to committee after substantial citizen outcry. Well done, citizens! Our current plan does not seem to be working, and we heard not long ago that Corrections wants $500 million to build more prison space to house these folks. I am sponsoring HB99, a bipartisan bill that would allow judges to deviate from mandatory minimums where required to avoid manifest injustice. It will be heard at 1:30 pm on Monday February 25 in the House Judiciary Committee – public testimony is welcome. Idaho’s application for Medicaid expansion was sent off to the feds last week, as required by Prop 2, but we still expect legislative efforts to curtail the full scope of coverage. One such effort is making its way through the Senate, another is expected in the House. The Gerrymandering bill (HJR2) is moving like greased lightning through the Legislature, and it’s critical that our citizens understand what is happening. In a nutshell, since Idahoans voted in 1994 to amend the Constitution to get rid of partisan gerrymandering, Idaho has had a bipartisan, evenly divided 6-member Redistricting Commission that draws district lines every 10 years. In order to be approved, a map must receive at least 4 votes, so all redistricting must have bipartisan agreement. We have thus been immune for the past 25 years from the bitter partisan gerrymandering battles that have plagued other states. But perhaps no longer. On Friday, with barely one day’s notice of the hearing, HJR2 passed on a straight party line vote in the House State Affairs Committee. This bill would add a 7th member to the Commission to be selected by GOP elected leaders, creating a 4-3 GOP advantage and allowing the GOP complete control over redistricting. Democrats on the Committee objected to a matter of such importance being rammed through so quickly, and walked out in protest – here’s a helpful article summarizing the proceedings. Excerpt: There are days when the Idaho Legislature resembles a much-higher-stakes three-ring circus, and Friday was one of them, as a bitter dispute over a GOP attempt to engineer a Republican majority on Idaho’s bipartisan Redistricting Commission led to a walkout, a breakdown in procedures on the House floor and fraying tempers all around. Excerpt: The bill for Idaho’s failure to seriously address our prison problem is about to come due, and it’s a big one: $500 million. That’s the cost of a proposed state prison expansion. What’s worse is that Idaho will have to issue bonds for the project, which means we’re on the hook for principal and interest.The causes of Idaho’s prison problem are well beyond the scope of this column. 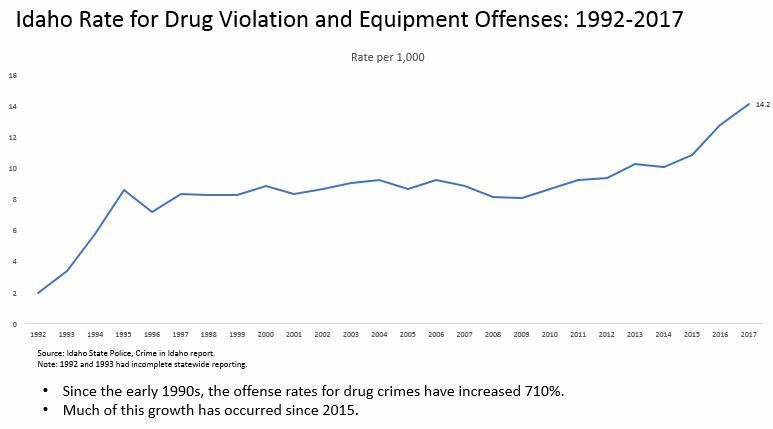 However, one of the big factors is the failed war on drugs. Our prisons are bloated with nonviolent drug offenders caught up in mandatory minimum sentences, which have proved to be costly, ineffective and a danger to our communities.